Water and Energy is the theme of World Water Day in 2014, observed on March 22. On the official website, it states: "Water and energy are closely interlinked and interdependent. Energy generation and transmission requires utilization of water resources, particularly for hydroelectric, nuclear, and thermal energy sources. Conversely, about 8% of the global energy generation is used for pumping, treating and transporting water to various consumers." Postcard US-2367611 to Turkey shows the Black Canyon and the Colorado River downstream from the Hoover Dam. Arizona is on the left side of the canyon and Nevada is on the right side of the postcard. The U-shaped structure at the base of the dam is the power plant that hosts power generators insider. 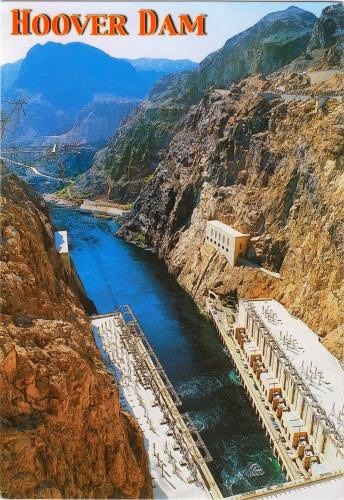 Now ranking in the 50th, it was once the largest hydroelectric power station in the world in 1939. In Las Vegas, to highlight that millions of people around the world still do not have access to a safe and steady water supply and sustainable solutions can be found if we focus our efforts and our resources, Cirque du Soleil is presenting an one-night-only annual “One Night for One Drop” spectacular for the second year at Mandalay Bay tonight, with performs by guest star entertainers and casts from Cirque du Soleil shows on the Strip. As a result, all eight Cirque du Soleil shows will be closed as the cast and crew are participanting the philanthropic show this evening.